Up north folks barbeque, which is grilling food over charcoal or gas. Don’t confuse with barbeque in the south which is pork meat slow cooked and served with sauce. 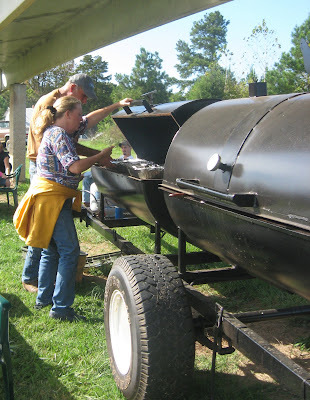 Northerners use BBQ as a verb to indicate a style of cooking while southerners use the word as a noun and to mean one specific dish which is universal to the south and very much a part of the culture. Confusing the way the term BBQ is used can be very . . . well . . . confusing. I remember my shock when I ordered BBQ up north and got a plate of beef ribs. Now I like ribs, but ribs are ribs and BBQ is BBQ. And, it’s pretty sad to get ribs when you want BBQ. On the flip side, I know that some of my northern students are plumb shocked when they order BBQ up here and get pork on a bun with slaw when they are expecting something grilled up like back home. That probably ranks up there with ordering a burger all the way at a southern restaurant and trying to figure out what that chilli and slaw are doing on there or having to say chilli beans to get any beans in the chilli. Barbeque dates way back in the south. You have to remember that the south was very poor (OK—we still are for the most part) and that pigs fend well in the wild. Pigs even made TV in the Australian outback on Survivor (though that did have that gross out factor). Those pigs are some hearty little critters that can scrounge around and make do when other critters would dry up and keel over. When you’re talking tough and stringy critters running wild, then you have to think a bit about how to cook. Though pigs now are farmed and fed and much more mellow as far as taste and texture, we are still not talking prime rib. My apologizes to all pig farmers. That tenderloin is primo, but some parts of the pig . . . well . . . guy-friend we need to sit down and talk about that crackled skin and those pigs feet. If you have a crock pot, then you know that slow cooking can soften up shoe leather. So, slow cooking those old pigs was the way to go. But, some folks slow cooked much better than others and BBQ became an art as well as a social tradition in the south. The cream floated to the top (as it always does) and the best pit cooks got noticed, and pit cooks figured out it was better to cook at an all day bash and have some company since pit cooking pork does take all day. BBQ was mostly take out in mid century and centered around the smoke house and maybe a shed type addition with a few tables and chairs for travelers. This was one time when white folks crossed the tracks. The BBQ was terrific and it was seen as somewhat “cool” to slip across town and get some good eating. That’s not to say that BBQ was not done in the white communities. It was. Many a white church dinner or political rally centered around picking a pig, but most of the take out places were black owned and operated (and many still are). The basic process at the smoke joints or at the picnics/rallies was to start cooking early and to cook all day. It was important to get the coals just right and to maintain that even and constant heat so that the meat was cooked through but not burned in spots. We’re talking a very high maintenance process which is why you don’t see fast food BBQ restaurants popping up all over. You can’t do BBQ fast, and if you do, then it is not really BBQ. Once the meat is done to perfection, then it is sliced or chopped up. Farther west it is pulled, but in the deep south (not including FL) then it is never pulled. Pulling is along the grain and gives a stringy taste which is not southern even though some southern states on the other side of the Appalachians mostly will sell you that. BBQ is usually bought by the tray which means that you get a cardboard container that is split with meat and slaw. Some slaws are white and some red. The red is generally spicy and has tomatoes and hot pepper while the white is mild and mayonaise based. With the meat/slaw you get bread and hushpuppies. The bread is to make a sandwich out of the meat and is our white bread which is light and airy. Some BBQ places give you buns instead so that you don’t get soggy bread (which I hate—do not pass a tomato sandwich my way please). Those hush puppies are corn bread deep fried in the skillet in ball or oval shapes. The thing that really sets the BBQ apart one place to another (besides the skill of the pit cook) is the sauce. Southerners get pretty prideful about the best sauce and the makers do not share those secret recipes. Those sauces are the stuff of legends with some makers taking those secrets to the grave rather than to ever tell how they do it. The base for the BBQ sauce in the south is vinegar. We do not put thick tomato based sauce on our meat as that is like putting catsup on your filet mignon. Basically you ruin the meat and insult the cook if you put any tomato stuff on the BBQ. If you must do that, then get take out and do not tell any southern soul. The other ingredients are usually secrets of the cook, but you can tell that most use some hot pepper to give a nip. I love it hot, so I lean toward the spicy pork places. If you don’t like spicy, then you can leave off the sauce or just use a little. The more you drip on the hotter the taste, so I go heavy (which is one reason I much prefer a bun for a BBQ sandwich). But, if you don’t try the sauce, then you really missed the southern experience as the sauce is mightily important. Around here, Lexington NC is the king of BBQ (and YES most BBQ cooks are men and not women). That is about a 45 minute drive. Here in my town, places will advertise as Lexington style BBQ to draw in crowds though some just build on the skill of the specific pit cook or the sauce like Richard’s of Salisbury. The Salisbury style barbecue includes a little ketchup in the vinegar sauce, and there's always a debate about that. Only really good BBQ survives around here and in most of the south. If you’ve never tried southern BBQ, then you are missing out on a food that has become an icon of the south. It cuts across all social lines—black/white, rich/poor, male/female, grown ups/kids. Although you may not see this mass-produced across the country, that has nothing to do with the taste. The only reason BBQ has not mainstreamed is that it takes a long time to make and the meat cooking and sauce are arts. BBQ just can’t be reproduced and packed in foil packs at the airport. But, maybe that is a good thing! Check out this funny and educational video. You'll enjoy some Southern string music and learn more about Southern barbecue as the guys cover it state by state. Thanks Ruth. Glad you're enjoying the blog. It's been working on it. Can't believe it's been almost 4 years now.